The latest handpicked villas to suit your holiday needs. A child must be under 12 years of age on the return journey to qualify for a child price. An infant must be under 2 years of age on the return journey to qualify for an infant price. They are not allocated a seat on the aircraft and must sit on an adult's lap. 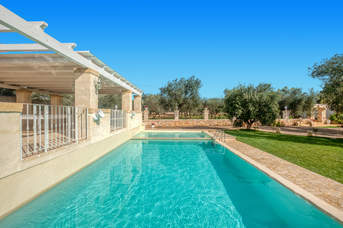 Enjoy the tranquillity of the countryside where olive trees have been grown in the rich, red earth for centuries. 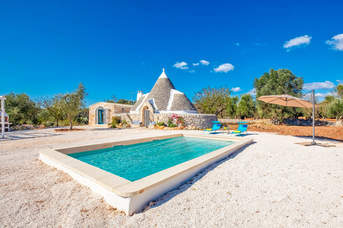 Unwind by your private pool, listening to the birds and catching up on your reading before venturing into town to capture the evening’s activities and find an authentic Pugliese restaurant.Enjoy the tranquillity of the countryside where olive trees have been grown in the rich, red earth for centuries. Unwind by your private pool, listening to the birds and catching up on your reading before venturing into town to capture the evening’s activities and find an authentic Pugliese restaurant. You’ll find a supermarket on the ring road below the old part of the town to stock up your villa. In the centre, there are smaller shops including green grocers, bakers and butchers. The weekly market takes place on Saturday mornings and you’ll see the farmers from the surrounding area selling their freshly grown produce as well as clothes and household items. For souvenirs, try the biscotti cegliese, biscuits made from almonds with cherry jam, all grown in the region. Ceglie Messapica has a great reputation for restaurants and has been holding an annual food festival in August for the past couple of years. Enjoy an evening drink and snacks in one of the piazza bars before discovering a restaurant. 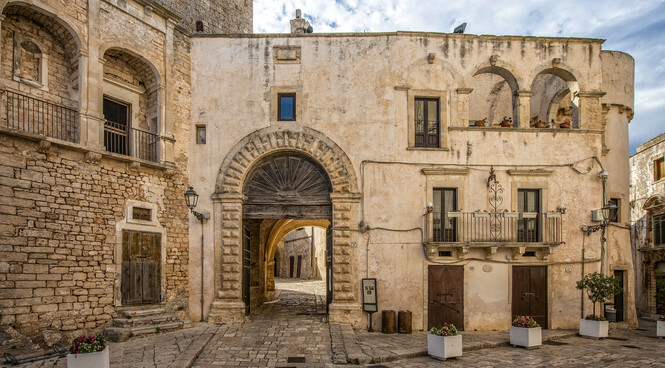 There are several good options tucked away in the Centro Storico and plenty of opportunities to try Pugliese food as well as Italian favourites like pizza and Caprese salad. The nearest beaches are between Villanova and Torre Santa Sabina. You can either visit one of the private beach clubs where sunbeds are available for hire or explore the small coves which have limited facilities but plenty of charm.To the south is the nature reserve of Torre Guaceto which has fine white sandy beaches and nature trails. At the Torre Guaceto National Park, you can hire snorkelling equipment or bikes to see the area in depth and at a leisurely pace. About an hour’s drive north is the theme park of Fasanolandia which has a number of rides and a safari park as well. The nearby towns of Locorotondo, Ostuni, Cisternino and Alberobello are all worth visiting. Towards the coast, about 20 minutes’ drive away is the small town of Carovigno which has a castle which was built by the Normans in the 12th Century with additions by the Swabians and Anjous. It was a private residence until the 1960s. There are no ratings yet for this villa. Your email has been entered into our data base, and you will now receive newsletters from Villa Plus.